A Canary mojo picón, or red pepper spread, is a typical sauce from the Canary Islands used to accompany several dishes, such as papas arrugadas (wrinkled potatoes). 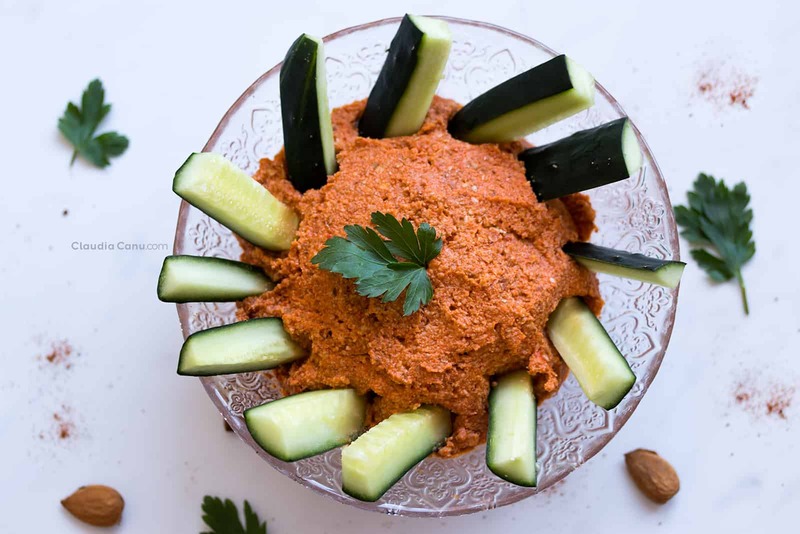 This recipe, however, is a spreadable version and is ideal for a healthy snack, an aperitif or to add it as a healthy fat to your balanced plate. 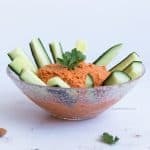 It’s a gluten-free recipe and you only have to eliminate one ingredient if you prefer to prepare a vegan version of it. It’s perfect to be added to your Healthy Meal Planning. Combine all of the ingredients into a food processor and voilà! In the video below, I also show you the consistency of the cream. Keep in mind that the ingredients can be added in the order that you prefer. Peppers can be bought in a jar, but make sure to read the label so that they do not have any added ingredients. I prefer to roast them myself. Actually, you just have to cut them and put them in the oven until they are tender. Keep in mind that the quantity of 150g is indicative and it doesn’t need to be perfect. If you don’t like the skin, it’s easy to remove it once they are already roasted and cold. I usually buy organic peppers and I usually leave the skin because once processed, you won’t notice it. As explained above, I usually eat this pepper pâté as a healthy fat with vegetables, almonds providing that fat. However, as the main ingredient of this recipe is red bell peppers, I prefer to tell you about all of the benefits that these vegetables have and that I discovered, thanks to James Wong’s book How to Eat Better. It seems that red bell peppers are the vegetable with the most antioxidant of the ten most consumed in the western diet, being even ahead of broccoli and spinach. A serving of 80 g peppers (just over half of this recipe) has double the recommended daily amount of vitamin C, plus they have fiber, vitamin A, and carotenoids. As often happens with other brightly colored vegetables, red bell peppers are, among their green, yellow and orange siblings, the ones that contain more polyphenols and carotenoids. Polyphenols and carotenoids are phytonutrients, chemical substances that are not essential for the human body but are beneficial for the prevention of degenerative diseases and, in general, favor a good state of health. Another interesting fact that I found in James Wong’s book, is from some studies on the best cooking method for bell peppers that indicates that the most beneficial is baked since there is no transmission of nutrients to the cooking broth. In addition, since the size of the peppers will be reduced with this method, its nutrients will be concentrated. Finally, another discovery of the science of nutrition is that the spongy, white tissue inside the peppers has a higher concentration of antioxidants and polyphenols than in the pulp. I’ve started eating red bell peppers only a year ago but if I had known all of its properties before, that would have encouraged me to start earlier. As I always say, the ideal in our diet would be to consume seasonal products. In the case of peppers, we are lucky because their season, in Spain, goes from September/October to June, although in the fruit shops we find them throughout the year. And if one day you can’t buy them fresh, there is always the option to buy them in a jar. This pâté of peppers has become a staple in my fridge, so regardless of the season, it is one of the recipes that I alternate when I prepare my weekly meal prep. Another fridge staple recipe is this capers hummus. And if you subscribe to the blog, you will see more recipes that I will be adding. I have an avocado sauce recipe that is super easy to make and it’s delicious! As with all of my fridge staples, I store this mojo picón in an airtight glass container. It lasts for about a week in the fridge, if I do not finish it earlier, of course;) I have not tried to freeze it because I usually finish it pretty quickly, but since it contains the fat from the almonds it should still taste good after thawing. Please, would you let me know if you try to freeze it? 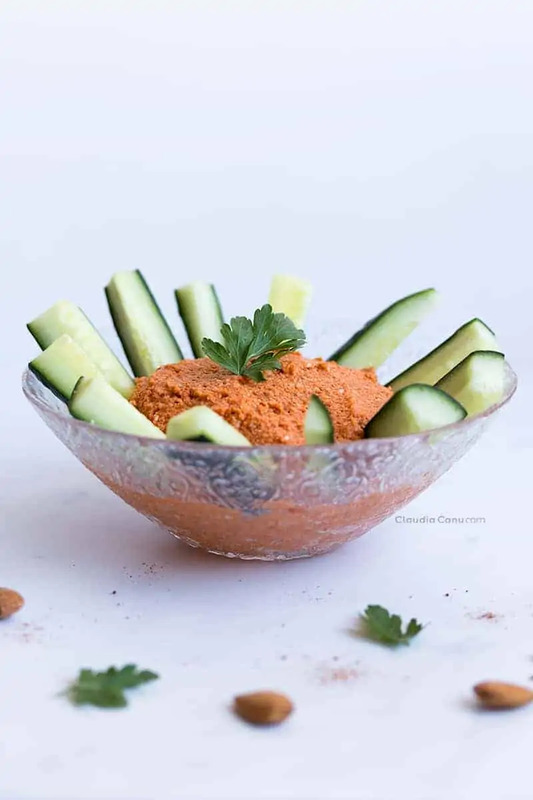 As I said at the beginning of this post, this recipe is more like a spread than a sauce, so it’s very easy to take it wherever you want. If, for example, you want to take it to work, to a picnic, or to eat with vegetables, you can use one of those recycled glass jars that you probably have at home, so that you can transport the amount you desire. Remember to keep the already cut vegetables in a separate bag since a prolonged contact with the pâté would soften them. You can do the same if you wish to bring some to eat with your homemade lunch. Insert a couple of tablespoons in a small jar and when you have heated the food you can add it on top. If you like toast, you can use this Canary mojo picón as spreadable and you could also add something on top, such as a piece of cheese, an anchovy, or some pickles. I use it as a healthy fat in my balanced plate to eat together with my baked vegetables. 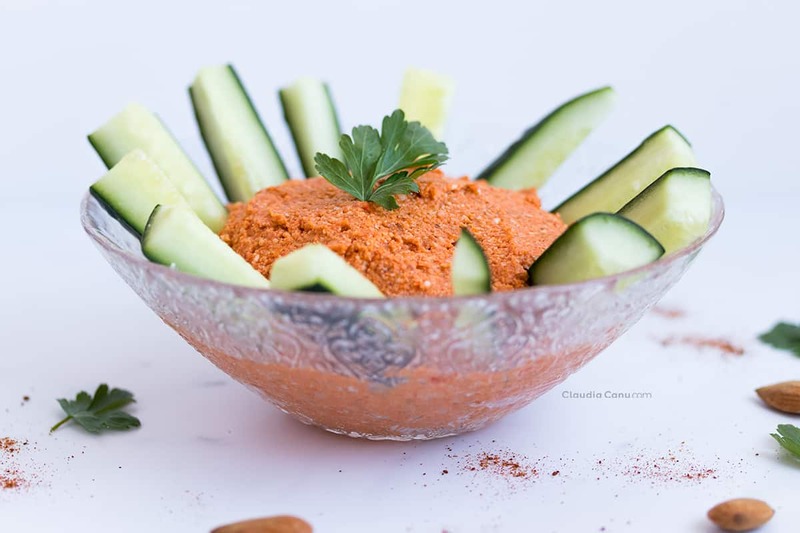 If you are vegan, or you cannot consume dairy products, it is very easy to adapt this recipe because you simply have to eliminate the cheese. Also, since the recipe has a very small amount of cheese, you do not need to change the amounts of the other ingredients. It will be just as delicious! In his book, James Wong proposes his version of mojo picón where the proportion of peppers and almonds is 4 to 1, or 400 g of peppers per 100 g of almonds. My choice for this recipe is a 1.5 to 1 ratio, that is 150 g of peppers per 100 g of almonds because my goal is to consume this pâté of peppers as a healthy fat. On another occasion, I added a spoonful of sesame seeds that does not change the flavor but continues to add more healthy fat. Also, one time I’ve tried it with green peppers and the taste was more bitter, which makes sense since red peppers are much sweeter than the green ones. Have you ever tried the original Canarian mojo picón? 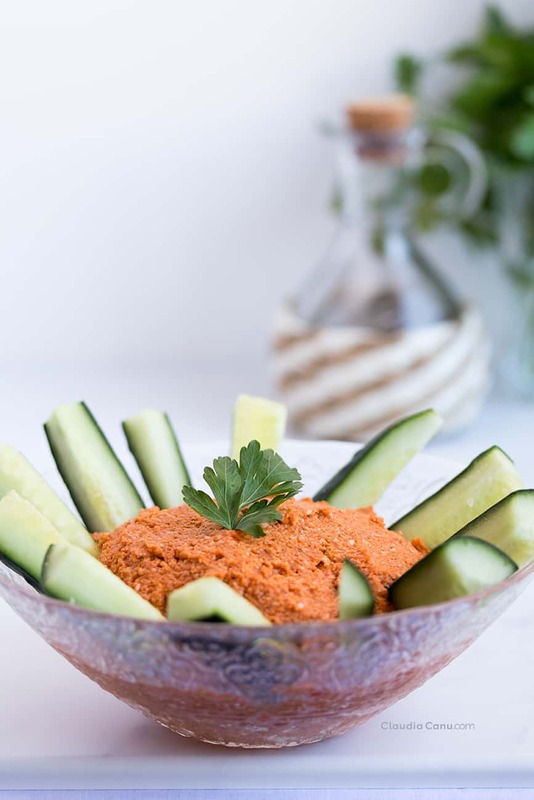 Do you think you’ll add this red bell pepper spread to the list of your fridge staples? As always, a thousand thanks for stopping by. 1. Add all of the ingredients in a food processor. One small and basic is enough. 2. Turn on the processor and mix the ingredients. If necessary, stop and, with the help of a spatula, clean the walls, as seen in the video. 3. Mix until you reach the desired creaminess. For a creamier version, you can add a little water. While I haven’t made this yummy pepper sauce myself yet, I was lucky to have tasted it as Claudia prepared it for a barbecue with friends not long ago and it was not just amazing but the highlight of the night. Goes with pretty much anything like tortilla chips, bread, meat, salad or by itself. Absolutely recommend trying it!